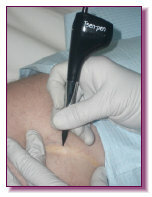 Scars resulting from trauma or cosmetic surgery are usually hypo-pigmented. These scars can be micro pigmented to match the client’s natural skin colour therefore camouflaging scars to be less noticeable to surrounding tissue. A test patch at R100 is normally required to match the damaged tissue to the surrounding areas. Cost for a scar tissue camouflage treatments are from R700 depending on the work required.